ORTON make vibratory conveyors find wide application in cement plants, steel plants, fertilizer industries, pharmaceutical industries, glass industry etc, where controlled feeding of material is required. 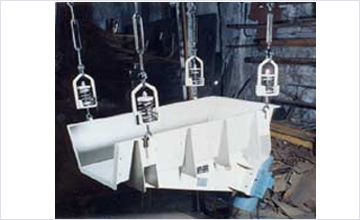 These conveyors have proved their reliability in transporting bulk material over limited distances. 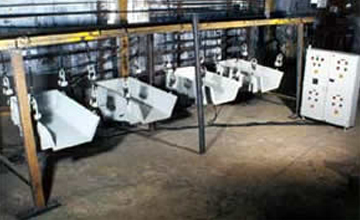 Depending on requirement and applications vibrating conveyors are available in electromagnetic & electromechanical types. Electromagnetic conveyors make use of an electromagnetic drive for generation of vibrations whereas electromechanical conveyors are powered by two unbalance motors rotating in possible directions. Electromagnetic vibrators are used in applications where stepless variation of feed rate from 0-100% is required. On the other hand electromechanical vibrators are used where the feed rate is not required to be changed frequently during operation or where a relatively constant feed rate is required. Very low maintenance required as the motors are extremely robust in construction & reliable in operation. Large magnitude of force can be achieved. Amplitude of vibrations can be varied by changing the position of the centrifugal weights in standstill condition of the motor. Extremely simple to connect and operate.